Paytm is an e-commerce website but first of all its an Online Recharge Portal which helps the users to easily recharge their Mobile, DTH Connection, Data Card, Pay Landline Bills, Electricity, Gas, and Book Bus Tickets. Every Paytm user might be familiar with Paytm Cash Wallet where your cash backs, failed recharge balance, as well as money you added to your Paytm Wallet etc. is present and later on you can use the balance from Paytm Cash Wallet to pay for various services, bills, shopping, recharge etc. 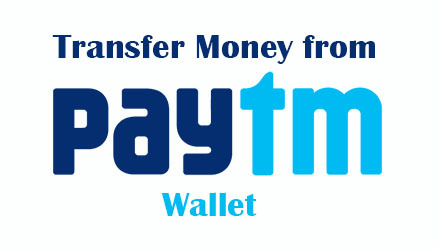 If suppose you want to pay or transfer money from your Paytm Cash Wallet to your friends or others Paytm Cash Wallet you can do it by using the Transfer or Send Money option. This feature to transfer money from Paytm Cash Wallet to other Paytm Cash Wallet is an instant payment system the opposite party who receives money from you will get instant notification on his mobile phone if he is having Paytm App installed on his smartphone as well as he can also check the balance by logging in to his Paytm account through website from desktop. 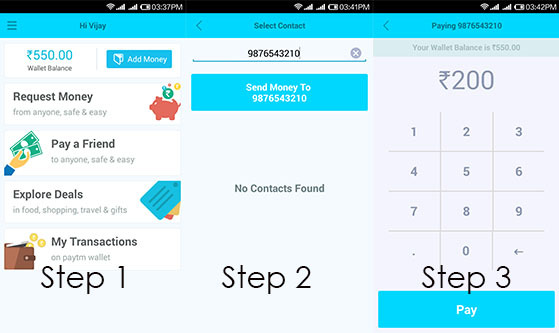 This feature which allows to send or transfer money from Paytm Cash Wallet to others or friends Cash Wallet is still unknown by many of the Paytm users but today we will reveal the complete steps on how to transfer money from Paytm Cash Wallet to friends or others Paytm Wallet. From your Smartphone go to App Store and search for “Paytm Wallet Transfer Money” App and install it. (This app Paytm Wallet Transfer Money App is available on all smartphone platforms like Android, iOS, Blackberry, Java Phones, and Windows Phone). After installing the App Paytm Wallet Transfer Money just open it and sign in with your Paytm Account details. After signing in you will be navigated to home screen of the app, from which to transfer money from your Paytm Wallet just click on Pay a Friend, and enter the mobile number of you friend or other person with which he have registered and verified Paytm Account after entering a valid mobile number click on send money and enter the amount which you want to pay for the friend or other party and click on Pay. That’s it your friend or the other party will receive the Payment from you instantly and he will also get a notification message on his registered mobile and later on he can check his Wallet Balance by using App on his smartphone as well as through website. How to transfer PayTM balance is mentioned clearly in above guide please read it carefully or you can also refer How to Send Money from Paytm Wallet on PC. Please update new version on blackberry world, old version does not support.